Manufacturer of a wide range of products which include stainless steel tank. Sujay industries manufacture and supply of all types of stainless tanks, vessels, Fabricated components as per the customer requirements. Our dexterous professionals, we have been able to give an excellent quality spectrum of SS Tanks and Vessels. These products are highly utilized in chemical, gas and oil industries for storage purpose. Manufactured by utilizing stainless steel, these products are high in demand for their pressure handing capability, superior finish and durability. Our offered tank and vessel is specially designed by some of the veteran experts to withstand extreme high pressure and temperatures. In addition to this, the provided SS tanks and vessels can be availed from us at affordable rates within a stipulated time frame. 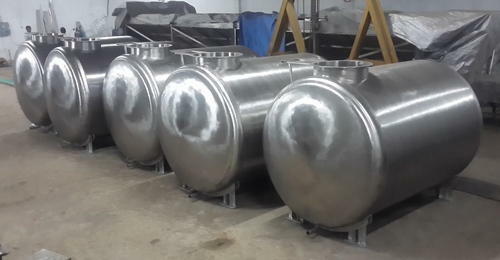 Looking for “Stainless Steel Tank”?